"The format of the board is instantly intuitive. 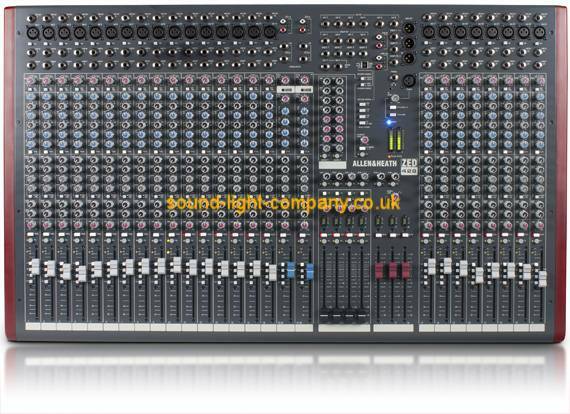 The usual Allen & Heath design makes you feel at home with every function, obvious buttons do the obvious things, and it sounds great." ZED-428 has a tuned 4-band EQ taken from the acclaimed GL2200 mixer, utilising MusiQ - with optimised slope (or Q factor) for equalising individual instruments. Based on the proven pre-amps from the hugely successful PA series, ZED-428 has DuoPre pre-amps, which use a two stage design, with carefully controlled amounts of gain in each stage. When amplifying the signal from the XLR input, the gain range is huge • 69dB of range to be exact • and is very evenly distributed around the gain control, meaning better control of signal level. Most of the gain comes from the first stage, so unwanted noise is kept to a minimum. Line level signals are simply plugged into the second stage of the pre-amp by using the line input jack socket, which has the great advantage of less noise when using the line input and also matching to a higher input impedance.